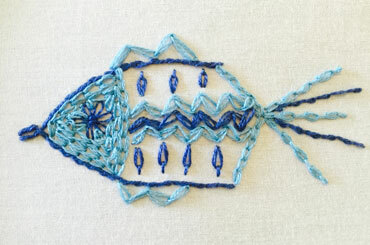 This little fishy could get you hooked on chain stitch in its many forms. Print this page and then transfer the pattern onto your fabric. Not sure how to do this, then check out some different options here. I suggest a firmly woven cotton or linen fabric for surface embroidery. You will also need an embroidery needle, hoop, and two shades of stranded embroidery floss. (I used 2 strands throughout). You will find instructions for basic chain stitch by clicking on the link in the list at the top of the page. Also on that page you will find instructions for detached chain or lazy daisy stitch. This is used to create a daisy for your fish's eye and for decorating his body. 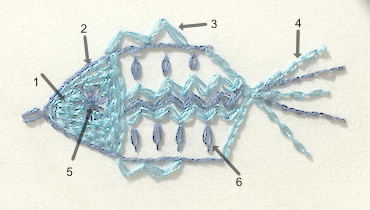 This current page explains how to work the other variations of this basic embroidery stitch. On the fish a twisted chain is used for the dark blue outline and the two dark lines in the tail. Begin at the back of the body, working from left to right. If you are working in the hoop, don't stretch the fabric too taut. A little "give" helps here. 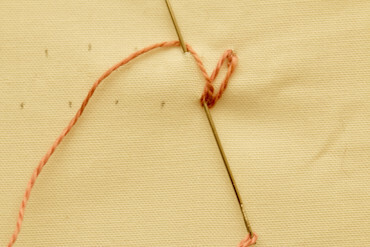 Bring your needle up through the fabric at the beginning of your outline. Insert it again right next to the original spot and bring it through the fabric about 5mm further along. Don't pull it through completely just yet. 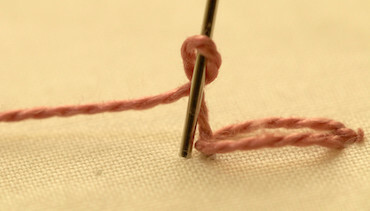 Take your working thread across the needle and under the tip, to create the twist. Then pull it through. The next photo shows how your work will look at this point. It almost resembles a little fish itself doesn't it? Take your needle down just outside the first loop and back up on the outline about 5mm further along. Again twist the thread around and under the tip of the needle. Then pull it through. Continue in the same manner around the outline of the fish's body and head. When you reach his mouth, fasten off by taking the needle down outside the loop. Then start again for the bottom lip. This is to give him an open mouth. 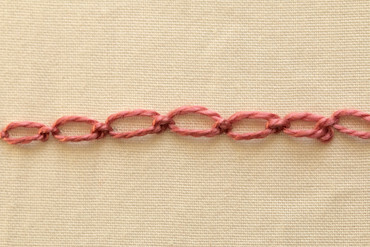 Here is my finished row of twisted chain stitch in the sample thread. 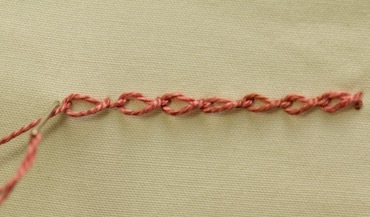 When the body and head are outlined also stitch the two lines of twisted chain in the tail. Don't be afraid to practice on spare fabric before working on your fish. Used for the decoration inside the body and the fins, zig-zag chain is a decorative variation that is easy to work. In my step by step photos below I marked a zig zag line of dots to help guide the placement of the stitches. This does help to keep the stitches even sized and on a straight path. You might like to do the same inside your fish instead of drawing the wobbly zig zag line in the pattern. 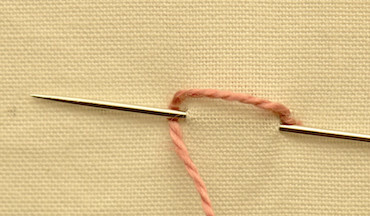 Take two tiny stitches to anchor your thread, then bring the needle up on your first dot. 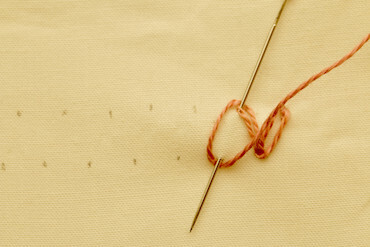 Insert the needle beside the thread and bring it back up on the next lower dot. 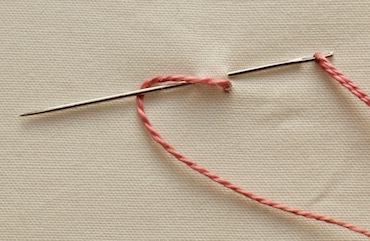 Take the working thread under the needle, then pull the needle through. At this point I tend to turn my hoop around so that it is more comfortable for me to work the next stitch. 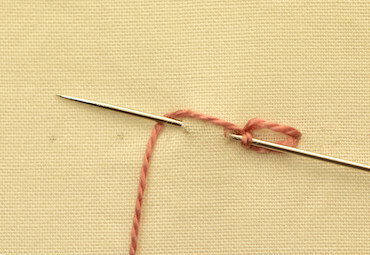 The trick to zig zag chain stitch is to pierce the thread of one stitch when doing the next. This keeps the angles of the stitches correct and in place. So take the needle down through the thread of the first stitch and up at the next top dot. 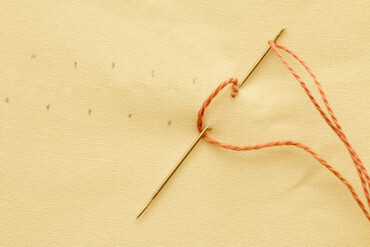 Pass the thread under the needle and pull through. 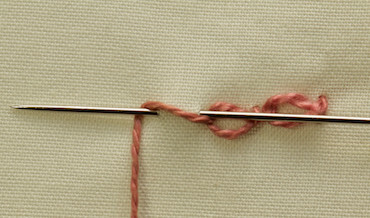 For the next stitch do the same thing, pierce the previous stitch and use the next dot along the bottom row. Here is my finished row of zig zag chain stitch. To complete it, take the needle down just outside the loop of the last stitch. Work three rows inside the fish's body, in alternate colors. Do you see how much more even this row appears than the rows in my fish? Marking those dots sure helps! The turquoise lines in the tail use cable chain. Close up it appears to resemble a length of chain links. This is one of those stitches that looks complicated, but in actual fact is fairly easy to work. Again marking off equidistant dots, with either a sharp pencil or a disappearing ink pen, will help you to keep the size of your stitches even. 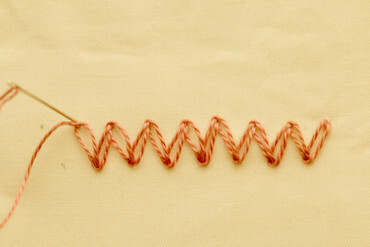 Start with a normal chain stitch. This is the tricky bit to photograph and explain, but trust me it isn't that difficult to stitch. In the photograph the needle is going to the back of the work just outside the first chain stitch. The thread is wrapped around the needle. Don't pull it all the way through at this stage though. Bring the point up on the next dot along your line. 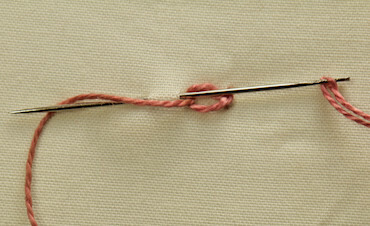 Wrap the thread under the needle tip and then pull it through. 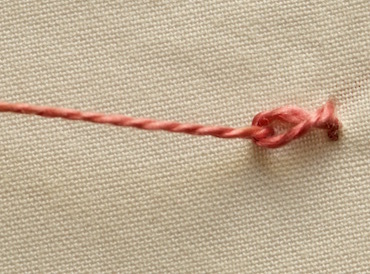 This creates a little knot, that holds the first stitch in place, while making the second chain stitch. Continue along the line in the same fashion. This photo of the completed line of stitches is taken from above. Do you see how the little knot stitch forms a link between the chains? I took this next photograph from the side. You can see the linking stitches from a different angle, which may make it easier to understand. 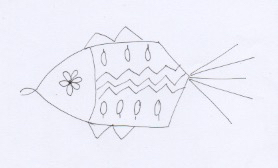 The tree like shapes within the fish's body are created with detached chain stitches. The link at the top of the page will explain the basic stitch, you will just make a longer tie down stitch to give the tail. Following the instructions for the detached chain stitch (or lazy daisy as it is also known), create a flower of petals for the eye. In my fish I used a single strand, but in hindsight it would have shown up better if I had used two. When the eye is completed, fill the rest of the head with rows of basic chain. Your embroidered fish is now complete. Along the way you learned how to do a variety of chain stitches, and can now use them in other projects with confidence. You might like to check out my other free embroidery designs on the site.